Kathy Hinde’s interdisciplinary approach combines different art forms frequently through collaborations with other practitioners, partnerships with scientists, and input from the audience. She has made work for concert halls, theatres, and galleries alongside site specific work for outdoor locations and unusual indoor spaces. She has shown work across Europe, Scandinavia, China, Pakistan, USA, Colombia and Brazil. 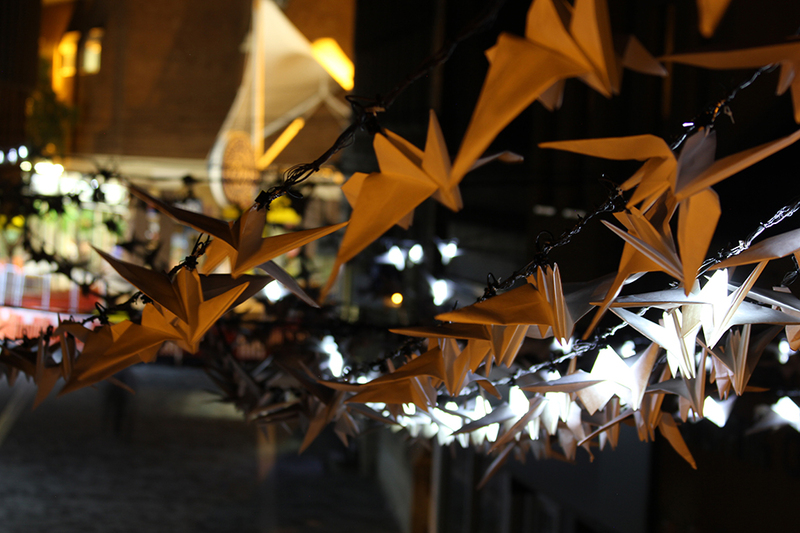 A new piece seeking to bring more of the natural environment into the city centre will see a flock of 64 origami birds with LED lighting suspended overhead in The Bridgewater Hall Piazza. As night falls the lighting creates the effect of birds flying along the street. The birds are arranged in rows, and each bird has its wings positioned at the next stage of flight within the row – aiming to create the impression of stop motion animation, using individually illuminated, hand folded paper birds. The action of many birds, flocking together, is one of nature’s most amazing phenomenon – an ultimate act of cooperation, hundreds moving forward in harmony.